Synopsis: Set in modern Iraq, this savage contemporary fable ignites when a pair of American soldiers return from a routine surveillance detail covered in blood. The barracks are no safe haven. The Captain fights to control his troops as they walk the high-wires of a secret homosexual affair, the sexual abuse of a female soldier, a missing Iraqi boy, and a baby found in the desert, ala Moses. 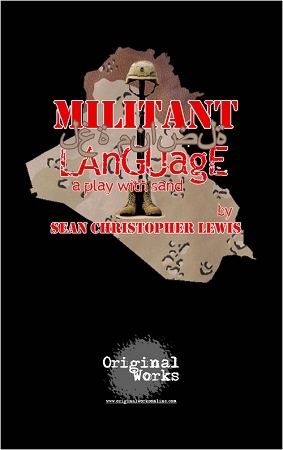 This play explores how violence begets violence, lies beget lies, truth is born from trust, and understanding war makes as much sense as sand raining from the heavens. "It's a disturbing, fascinating evening." "Lewis writes with great energy, some poetry and enough surprises."